We provide domestic electrical services to customers looking for an electrician in Glasgow and throughout the central belt of Scotland. Our friendly electrical team carry out a variety of services, ranging from full rewires, to simply changing a light fitting, carried out to high standards of safety and quality at competitive prices. 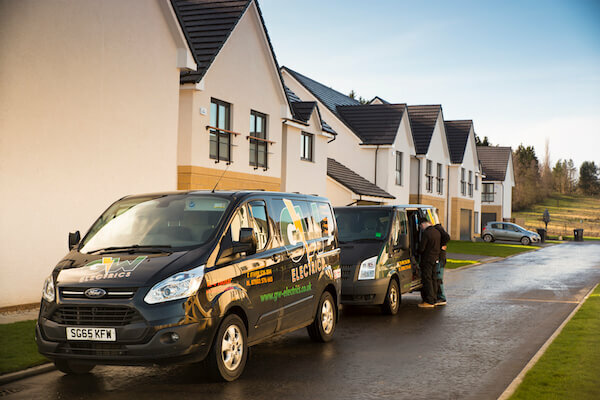 Our electricians in Glasgow and throughout central Scotland, have the skills, experience and tools to carry out full inspections and advise you on what work is required in your home in order to resolve any issues you may be having. Our team are equipped with the very latest modern equipment so that they can handle any job, whether big or small, to the same exceptional standards. Our friendly and reliable Glasgow electricians carry out everything from full re-wiring to simply changing a light fitting. All work undertaken is accompanied by necessary paperwork and up to date electrical installation certificates, issued after testing or work has been carried out. Once you have used our services you’ll be sure to keep our business card close at hand. We understand that many of the electrical tasks you want or need carried out in your home may seem daunting or confusing, and that's why you should call us. We’ve the experience and skills to make the changes you need in your home, whilst keeping you informed and involved throughout the entire process. Peace of mind is crucial, we ensure all of our customers have complete confidence with regards to the security, quality and safety of their domestic electrical work. We offer honest and impartial advice to find the best and most effective course of action for you. Contact us today to talk to our knowledgeable team.